In an effort to serve the needs of diverse communities and promote the welfare and intellectual progress of students, California State University, Northridge’s College of Health and Human Development will address these goals at its annual Public Policy Day on Monday, April 15, from 8:30 a.m. to 3:30 p.m.
Public Policy Day 2019 will focus on “Advancing Health Equity” and will explore the social determinants of health and toxic stress, the education system, immigration and communities, and current legislative bills. The event is expected to be held in the Delmar T. Oviatt Library Ferman Presentation Room. Hosted each year by the Marilyn Magaram Center, Public Policy Day explores how to effectively advocate for public policy issues related to health equity within education, immigration and nutrition. Hosted each year by the Marilyn Magaram Center, Public Policy Day explores how to effectively advocate for public policy issues related to health equity within education, immigration, and nutrition. In previous years, students showcased legislation from state Assembly members and other legislators, explaining why their selected topics were important. They dove into how to formally initiate conversations with public officials on issues related to public policy. This year’s keynote speaker is Flojaune Cofer, senior director of policy at Public Health Advocates, a company that promotes health by transforming neighborhoods into places that nurture well-being for all of its residents regardless of age, ethnicity or income. The program has been approved by Los Angeles District Academy of Nutrition and Dietetics to provide Continuation Professional Education Units. Speakers will include a range of officials from the Los Angeles County Department of Public Health (LACDPH), Department of Planning, LACDPH Office of Immigrate Affairs, Youth Policy Institute, the Asian Pacific Islander Froward Movement, CA Food Policy Advocates, Los Angeles District Academy of Nutrition and Dietetics and CSUN dietetic intern. Kelly Warner from LACDPH Nutrition and Physical Activity Program, will serve as the emcee for the event. 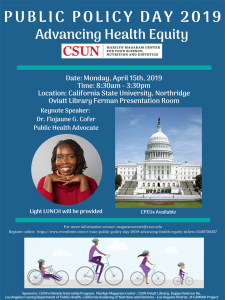 To register visit: https://www.eventbrite.com/e/csun-public-policy-day-2019-advancing-health-equity-tickets-55481726337. For more information on Public Policy Day, email margaramcenter@csun.edu.